back to the roots + giveaway!! I love people that create meaning in their lives. Alejandro Velez and Nikhil Arora have done exactly that. 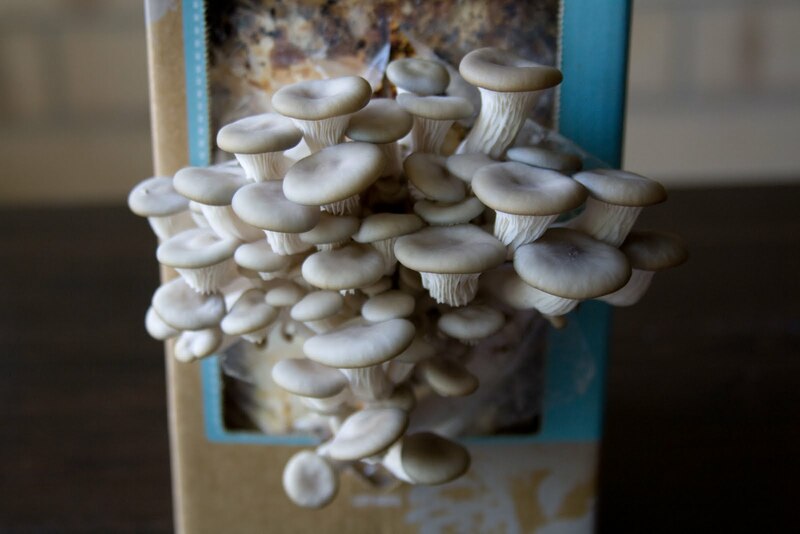 As about to graduate college students, they took the idea of growing mushrooms in used coffee grounds and ran with it, creating their company Back to the Roots. 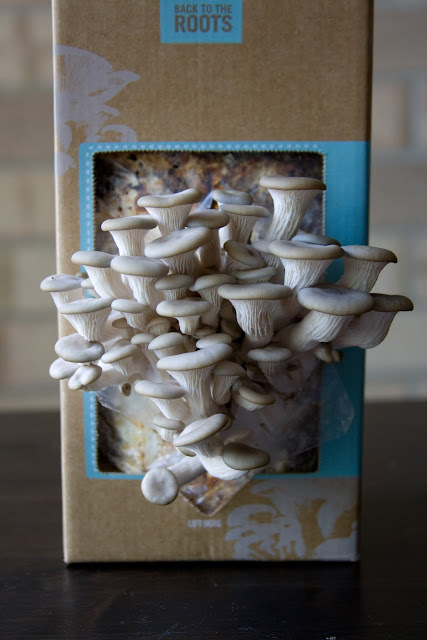 I heard about their mushroom kits just over a year ago on Chloe Coscarelli's website. 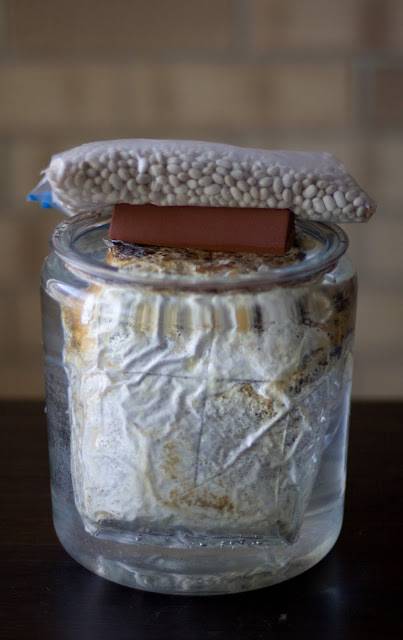 I thought it was a brilliant idea then, pinned it to my mental boards for the future (pinterest wasn't around then), and what do you know a year later they sent me my very own mushroom kit! Fate treats me well. 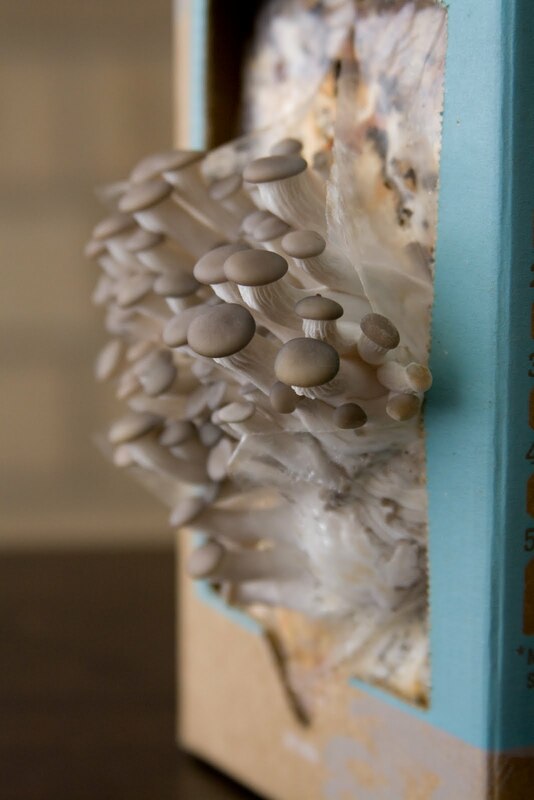 I'm now an official urban mushroom farmer.. or rather suburbian. 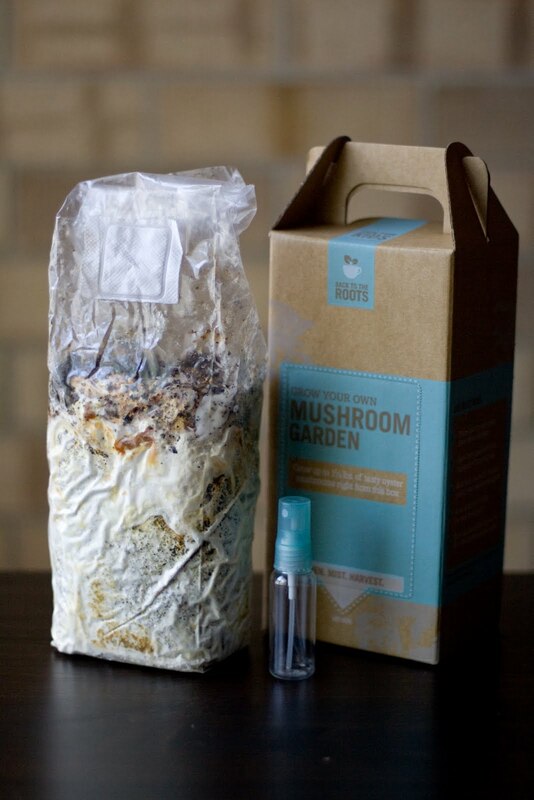 The kits come with instructions, a spray bottle, the mushroom root in coffee grounds, a box that you place the mushroom root in, and a lovely earthy smell. A few things I loved.. There were mushrooms growing in my kitchen, my kitchen! I was actually growing something! I have such a brown thumb. They're super kid friendly, even for toddlers.. coupled with supervision and loving guidance of course. If you post a pic of your grown mushroom kit on their facebook page, they send a mushroom kit to a classroom of your choice. They sell replacement bags. You keep your box, buy another bag with a beautiful root inside, and keep on growing! Some people say their companies are sustainable, but they really aren't as sustainable as they claim, but these guys are legit. too legit. They take the used used coffee grounds (got that?) 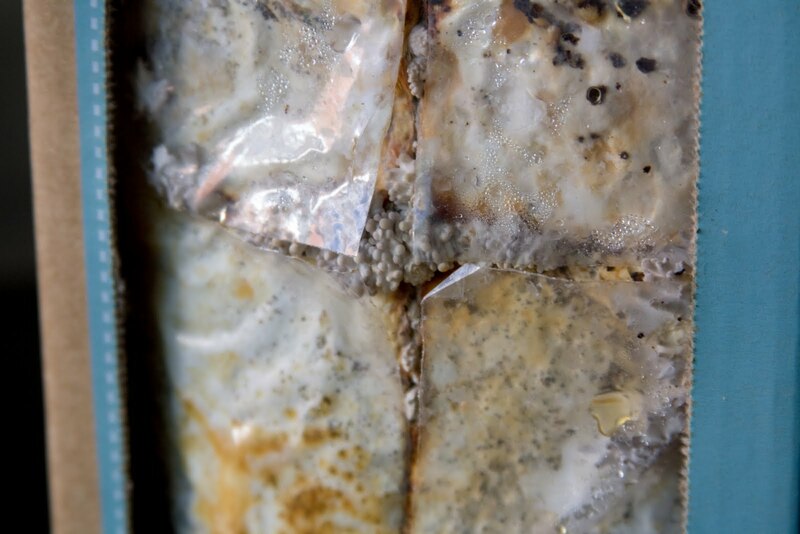 and create an uber healthy super power soil amendment (added to soil to improve its health); super cool. They were a type of mushroom I'd never had before. 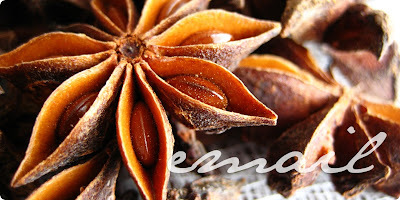 I loved eating them. yum. So are you ready to grow some shrooms of your own? Good! 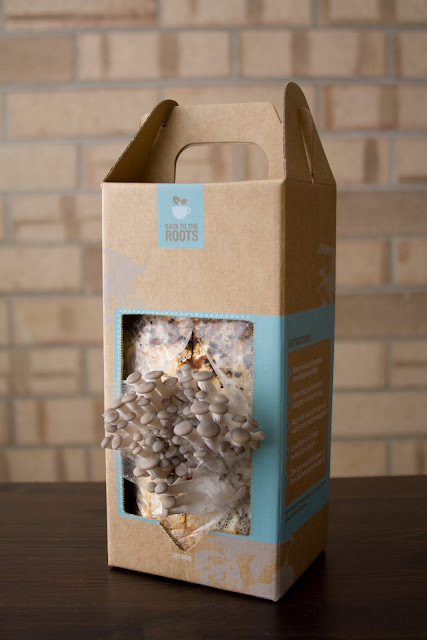 Back to the Roots is offering my readers (you) a chance to win your own mushroom kit! Just leave a comment on this post to enter and I will chose a winner next week. giveaway closed. And if you have a moment, or 14 minutes worth, watch Alejandro and Nikhil's TED talk about how they started their company and a little about its sustainability. It's funny, touching, and makes you grateful for adventurous and curious minds as well as communities of people who share a love for real food and sustainability. I want in. I will take them! I just wanted to comment and tell you how fabulous that first photo is--LOVE it! That is SO cool! Sign me up! in. completely & utterly in. 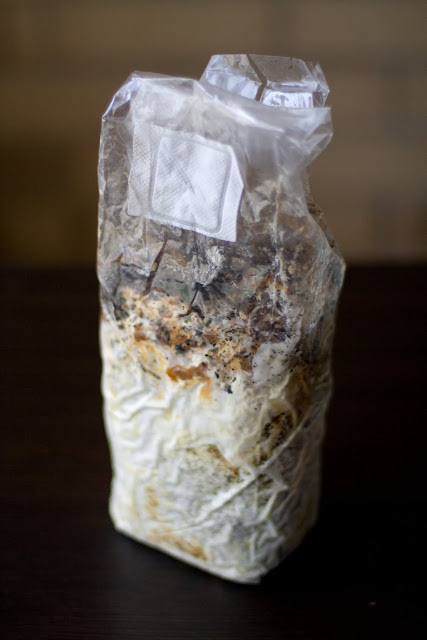 I want to grow my own mushroom!!! I got this log one time from Down East...don't know why they were selling them...but it never amounted to any mushrooms. How fun! I would love to grow my own mushrooms. Then I would make wild mushroom risotto or mushroom and spinach saute or grits with mushrooms!! Their packaging is great also. 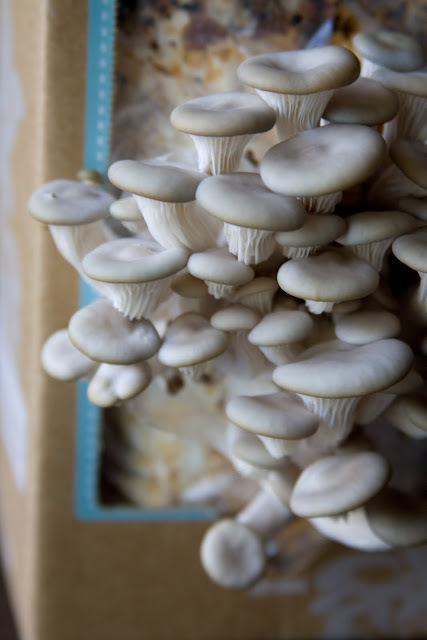 Oh man...I love mushrooms and I would love to have them growing right in my kitchen. how awesome! i would love to try it! I would absolutely love to win! Like Natalie, I'm in college and live in a dorm so growing most produce is out of the question but this would be wonderful. Nikhil and Alejandro are so inspiring! Thanks for introducing me to this great new product. I bought the kit, but 10 days later there is no sign of a mushroom. I cut the plastic as indicated, soaked the kit, misted faithfully twice a day, let sit on a northern kitchen window sill. Does anyone have an idea of what could have gone wrong? Maybe too cool near the window? It may be the temperature, they like moist cool places, but not cold. Also, I don't think they are supposed to be put in direct sunlight. Did you email them your concerns? They are usually very helpful when it comes to troubleshooting. I hope they sprout soon, good luck! !